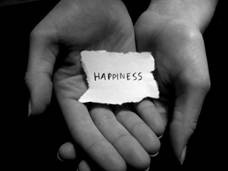 Happiness is probably the thing people dedicate their life to achieve the most. Their definition of happiness is different from one to another, but when they focus on a relationship, they want to be happy in that relationship, when they focus on money, they want to be happy with their financial situation, when they try to be healthy, they want to be happy with their body and wellbeing and when they spend time with their kids, they want to be happy in their parenting. Happiness covers every area of life. Life is a journey to many destinations, but in all of them, we seek to be happy. 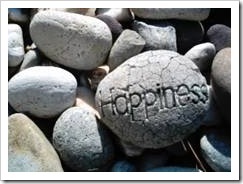 Would you like to have a happiness manual? When Gal and I started Be Happy in LIFE, we looked for a statement that would convey all of our vision and purpose in a clear and concise way. If you have ever been involved in communicating the key ideas behind a business, you understand how difficult it is to capture your entire philosophy in a short statement. It was a challenge. Unfortunately, too many people live a life without a philosophy, a vision or a purpose. I know how it feels. After all, as a kid, I lived my life like this, not knowing any other way. Without a purpose, life is just a collection of random events that people react to. If something good happens to them by accident, cool! But if it is bad, they deal with it (or not). This is almost like going on a wonderful, exciting trip without any preparation, with no destination in mind and no equipment or supplies. Gal and I believed life was a wonderful trip that was best experienced as a bit more than browsing and surviving challenges along the way. We realized living purposefully had some great advantages, so we looked for the ultimate purpose. No matter who we are, old or young, knowledgeable or ignorant, curious or bored, single or in a relationship, we all look for meaning – something that will motivate us to do something and to be somebody. This motivation is the fuel of our existence. Without it, there is no point in learning, no point in working, no point in achieving and no point in relating to others. Can you feel how depressing this “no point” state of mind is? As we tried to find this meaning in our life, we realized that happiness was the meaning of life and also the purpose of our business. 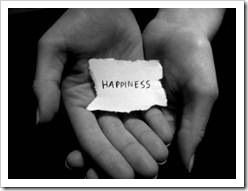 When we chose the name Be Happy in LIFE, we knew we had found our purpose. What else is there? 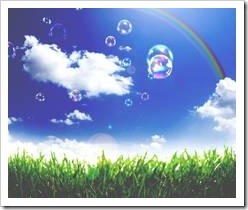 Before Be Happy in LIFE, I had worked for years on my theory of success. I called it “The Success Experience Theory”. It was at the heart of my professional and parenting success. 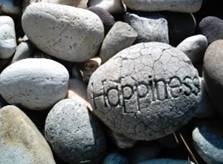 While the success experience theory focused on success at school and in the academic and emotional areas, my later shift towards happiness was natural. During my special education studies, I had the opportunity to work with Gideon Carmi, a professor from the Hebrew University in Jerusalem, on a special project called “Creative Thinking”. Much of my work was derived from this project and close contact with its creative founder. I was part of this research program for 4 years and became a key person in the development of the program. Professor Carmi was an expert in theoretical physics who wanted to teach physics laws to kids aged 4 to 8. Others did not believe it was possible, but from my work with him and from seeing over 1,000 kids (personally) over 4 years, I learned you can teach kids whatever you want if you use the right tools. Equipped with this belief, 4 years of intensive experience in the creative thinking project and my emotional intelligence studies, I wrote the “Garden of Eden” program. In this program, I used many of the Creative Thinking project concepts and special education knowledge and after a short time, “my” kids reached academic, physical and emotional abilities much higher than expected for their age. Starting with “regular” kids aged 1½ to 4, it took me 3 months to show that each child was amazingly gifted. These kids learned “from the molecules in the air”. Their parents did not believe their kids read, add, subtract, display extraordinary fine and gross motor skills and work independently on a 60-piece puzzle at such a tender age (sometimes, a group of 3 or 4 kids would sit and do a 240-piece puzzle together). At first, I did not believe it either. When the first 2-year-old did something unusual, I said to myself, “She is just unique and especially smart”, but when the fifth one did it, in the exact same way, I knew that I had found the formula. Although there are many aspects to the program, the main idea was that as long as I introduced the experiences in such a way that the kids were successful, they could overcome any challenge or difficulty and easily absorb new information presented to them. Happiness works the same way. 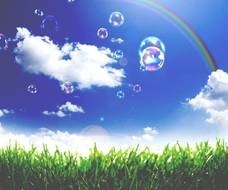 The happier we are, the easier it is for us to handle challenges and overcome difficulties that are part of everyday life. Some time ago, I wrote a story that explains how it works. When Princess Ella was born, her proud and happy parents, the queen and the king, were the happiest people in the kingdom. Ella was their first-born and many wizards, scholars, advisors and messengers from neighboring countries came to her birth party to show their respects, and offer the baby a gift. Each person went up to the baby’s crib and put a gift next to it. One brought Princess Ella a dress, woven with diamond thread, so that her inner beauty would shine through her dress. One brought the princess the book of all knowledge so that she could hold the key to all possibilities. One brought her a special worm to put in her water fountain. This worm would purify the water she drank and keep her healthy. One brought the baby a special necklace that shone in the presence of positive loving people to protect her from bad influences. Then, an old man moved closer to the king and the queen and handed them an empty, clear and beautiful glass bowl. “This bowl holds all the feelings of your little princess. When she experiences happy things, a glittery, shiny drop will appear in the bowl. When she has an unhappy experience, a black drop of poison will appear in the bowl”. Everyone at the party looked at the old man in surprise. “Her happiness depends on the number of glitter and poison drops she accumulates in the magic bowl. If she has more glitter than poison, she will be happy. If she has more poison than glitter, she will be unhappy”, said the old man, and he smiled at the surprised queen and king, “Oh, by the way, it takes 10 glittery drops to cancel out each black poison drop”. The queen examined the bowl carefully. “Most people have brought gifts for the little princess. Why did you give this bowl to us?” she asked. “This bowl will help you see what is in her heart. Emotion bowls are for the parents to hold until their kids are strong enough to hold them on their own”, said the old man. 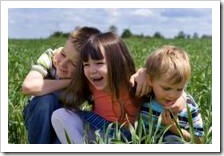 Parents are very important in the development of happiness in their kids’ life. This is why so many people blame their parents for their unpleasant feeling. However, there is a point in time when every child must take responsibility for his or her bowl of feelings. The lucky kids slowly develop this responsibility as they grow up. Others get up one day and realize that blaming Mom and Dad no longer works. Unfortunately, some kids never develop this responsibility and go through life expecting circumstances and other people to make them happy, putting more and more poison in their bowl of feelings. 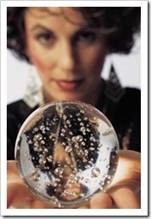 Coaching is the process of guiding people towards a clear crystal bowl, full of shiny glitter drops, and helping them realize that no one else holds their bowl for them. They need to take full responsibility over their own happiness. That is why it is called “Personal Development”. When Gal and I looked for a motto to express our Be Happy in LIFE philosophy, vision and purpose, we realized the key to being happy is taking this responsibility and that being happy was a choice. Here is another beautiful story I find inspiring and useful in shifting perspective from being a kid who thinks life is in the hands of circumstances and others to taking full responsibility for our happiness. You are welcome to print it as a reminder. Happiness is the choice to feed the good wolf and fill your bowl of feelings with joy and love. Every minute of our life, whatever happens to us, we can choose which one to feed. I am writing this after a person I know fed the wrong wolf to death, so I urge you to examine your bowl of feelings, to find out if it is full of glitters or poison and to notice that the battle is inside you all the time. 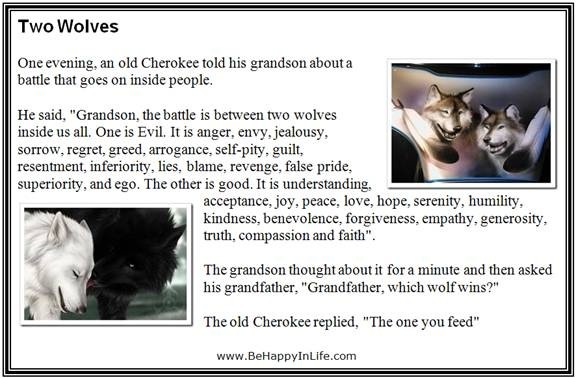 The two wolves are there, fighting continually, but we, as masters of our minds, can choose in every situation in life to feed the happy wolf with understanding, acceptance, hope, love, kindness and forgiveness. After all, we are feeding our own mind. Choosing happiness starts with recognizing how you feel. You may be surprised to know that not all people know how they feel, simply because they have not practiced paying attention to their feelings. The best way to start is to ask yourself, “How do I feel now?” over a week or so, until you recognize your feelings quickly. If you want, print this card and carry it with you for over a week. It will help you discover which of your wolves is winning. 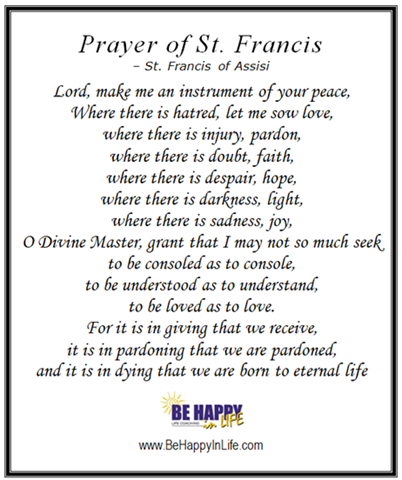 St. Francis of Assisi wrote a beautiful prayer that teaches us how to feed the right wolf. 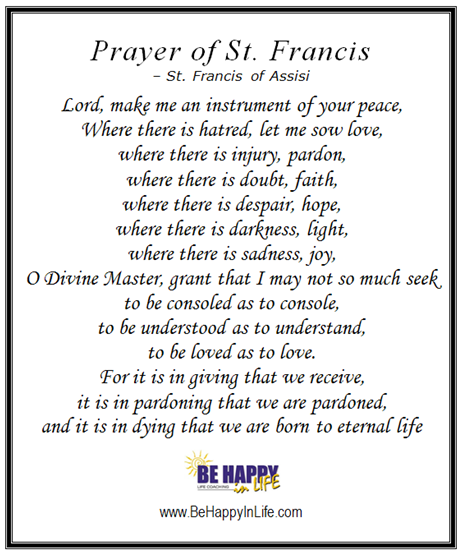 I love this prayer very much. I got it as a farewell present from one of my Grade 10 teachers and kept it with me for about 30 years. I hope you will take as much inspiration from it as I have. As we are getting closer to the end of 2009, I hope this will help you prepare for the “closing ceremony” of counting your successes and achievements for this year and that it will motivate you to take full responsibility over your bowl and empower you to choose to feed the right wolf. Happiness is a choice! May your happy wolf win!